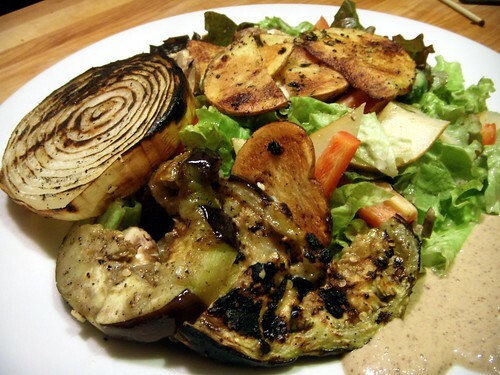 hearty winter salad with grilled vegetables in a black bean caesar dressing, originally uploaded by aarn! +12th January, 2009+. the dressing was kind of an experiment (as usual), but turned out totally delicious. in a food processor, combined a small clove of garlic, an egg, 2-3t. worcester sauce, 4-5 fillets of canned anchovies in oil, 2-3T. panko breadcrumbs, 1T. lemon juice, 3-5T. of drained canned black beans, 1T. mustard (spicy smooth dijon), salt, and fresh cracked pepper, and pulsed until smooth. then gradually drizzled 3-4T. of canola oil in while blending. half-skinned a medium sized eggplant (cut strips out of the skin with a peeler, eggplant skin can get really bitter), then sliced into 3/4-inch thick discs and rubbed with salt, fresh cracked pepper, olive oil, and crushed garlic. grilled the eggplant, as well as skewered 1-inch thick cross-sectional slices of sweet spanish onion (thanks for the tip, cooks illustrated: summer grilling and entertaining issue 2008, the bible for next summer), and a whole poblano pepper, until nicely colored and adequately tender. some red lettuce, sliced baby portobello mushrooms, sliced sweet red pepper, and wedges of bosc pear were tossed with some of the dressing, and topped with some thick oven roasted potato chips, which were prepared with some thyme, salt and pepper and baked until brown and crispy on the outside. served with a slice of the grilled onion, a few pieces of the grilled eggplant, and a few slices of the poblano pepper (probably around the back side of the heaping salad, in the picture, the plate pictured is a 12" charger btw) this salad was hearty and filling.